Britain's Prince Philip has been spotted driving without a seat belt just 48 hours after his car crash in which the 97-year-old's Land Rover flipped onto its side. 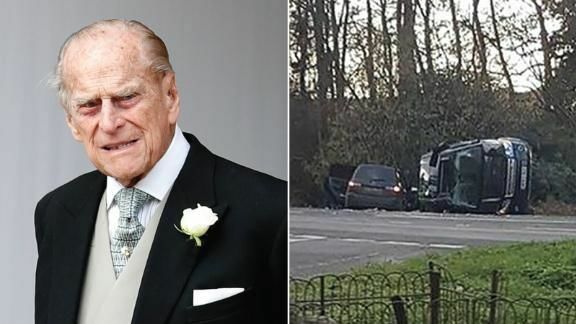 (CNN) — Britain’s Prince Philip has been spotted driving without a seat belt just 48 hours after his car crash in which the 97-year-old’s Land Rover flipped onto its side. According to Britain’s Press Association, the photographs showed Philip wearing dark glasses and no seat belt near Queen Elizabeth II’s Sandringham Estate in Norfolk, eastern England. Buckingham Palace said “well-wishes” were exchanged Friday with those injured in the other car. However Britain’s Mail on Sunday reported that the mother who broke her wrist has yet to receive an apology from Philip. The United Kingdom requires drivers over 70 years old to renew their license every three years. A royal source said Thursday the prince has a license and follows all procedures required to keep it up to date. The source asked not to be named discussing the prince’s personal life. Since taking a step back, Philip has been seen in public at a handful of events with the Queen and other members of the royal family, including last year’s weddings of Prince Harry and Meghan Markle and Princess Eugenie and Jack Brooksbank.